To send us a message - Click here. 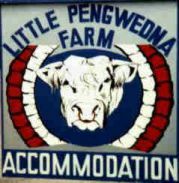 Address:- Little Pengwedna Farm, Helston, Cornwall, England. TR13 0AY. The most direct route to us from Exeter is the A30 road via Okehampton to Hayle. At Hayle take the B3302 road for Helston, through the village of Leedstown. Go straight over two little X roads, and our farm entrance is the first on the left. If you approach Little Pengwedna from Helston, take the A394 for Penzance. At the Sithney Common junction, 1/4 mile out of town, turn right on to the B3302 road for Hayle. You will find us approximately 2 miles along this road on the right. There is adequate parking along the left hand side of the house - please drive in. Location: Lat. 50 degrees 8.2 minutes North, Long. 5 degrees, 18.2 minutes West (SW 629 313), OS sheet 203. At Exeter leave the M5 at junction 31 approximately 2 miles past Exeter Services, head for Okehampton via the A30. Follow the A30 via Bodmin, at Carland Cross take the A3076 (2nd exit of roudabout) to Truro. At Truro head for Falmouth (A39). After 8 miles take the A394 for Helston. At Helston take the A3083 for The Lizard. You will pass RNAS Culdrose on your left hand side. At the roundabout take the B3293 for St. Keverne. Continue past Goonhilly Earthstation, after 2 miles take the B3294 for Coverack 1/3 mile past Zoar garage. 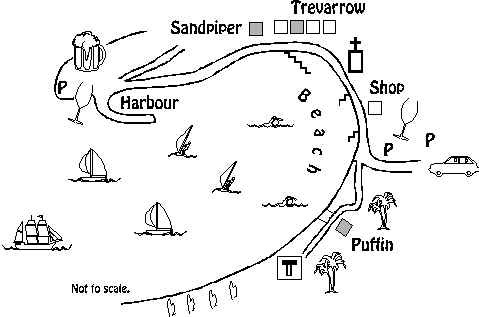 When you arrive at Coverack sea front locate your Cottage using the map below.